[157 Pages Report] The infant formula ingredients market was valued at USD 13.99 Billion in 2016 and is projected to reach around USD 23.79 Billion by 2022, at a CAGR of 9.4% from 2017 to 2022. The infant formula ingredients market has been segmented on the basis of type, source, form, application, and region. This report includes an estimation of market size in terms of value (USD million). 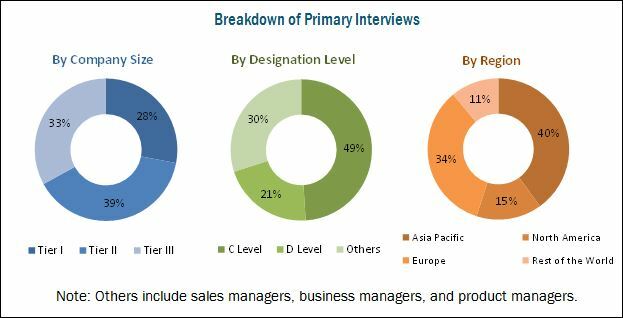 Both, top-down and bottom-up approaches have been used to estimate and validate the size of the infant formula ingredients market and various other dependent submarkets in the overall market. Key players in the market have been identified through secondary research such as Hoovers, Forbes, and Bloomberg Businessweek, company websites, annual reports, and their market share in respective regions has been determined through primary and secondary research. All percentage shares, splits, and breakdowns have been determined using secondary sources and were verified through primary sources. The key players in the infant formula ingredients market include Arla Foods amba (Denmark), Glanbia plc (Ireland), Sachsenmilch Lepperdorf GmbH (Germany), AAK AB (Sweden), and Carbery Food Ingredients Limited (Ireland). The maximum value addition of a product in the global infant formula ingredients industry is observed in the stage of manufacturing. The key companies that offer infant formula ingredients mainly invest in new product developments and expansions. Companies formulate new sales strategies to establish their innovative products in the market. These companies highlight product specifications and certifications from food safety authorities while promoting their infant formula ingredients products. Value addition in the distribution and sales stage varies with key players, addressable markets, manufacturing units, and end consumers. This research report categorizes the infant formula ingredients market based on type, source, form, application, and region. The global infant formula ingredients market witnessed steady growth over the last few years. The market size is projected to reach USD 23.79 Billion by 2022, at a CAGR of around 9.4% from 2017 to 2022. Increasing number of working women and the preference over convenience feeding has been the major driver that has contributed to the growth of the market. The infant formula ingredients market, by type, is segmented into carbohydrates, oils & fats, proteins, vitamins & minerals, prebiotics, and others (nucleotides, emulsifiers, and probiotics). Carbohydrates is the most widely used ingredient in the production of infant formulas. Since it is a vital source of energy for the growth of infants, it is the major factor leading to the growth of the carbohydrates segment. By form, the market has been segmented on the basis of powder and liquid & semi-liquid. Powdered infant formula ingredients are most widely used by manufacturers, as they are easier to handle compared to liquid infant formula ingredients. Several types of infant formula ingredients proteins, carbohydrates, some fats, prebiotics, and micronutrients are commonly used in the powdered form for manufacturing infant formula. On the basis of application, the infant formula ingredients market is segmented into growing-up milk, standard infant formula, follow-on formula, and specialty formula. The growing-up milk segment accounted for the largest market share in 2016. They are usually fortified with calcium, vitamin D, and iron as nutrients. Growing-up milk is designed to meet toddlers’ growing needs, and can be consumed as part of a balanced diet. It can be used as a nutritional drink or can be combined with other foods and hence it has the widest application in the infant formula ingredients market. The demand is increasing in the market as parents are becoming cautious about the food they feed to their children and the rising awareness about the available options in the market has further led to the increased demand for growing-up milk. The infant formula ingredients market in Asia-Pacific was the largest in 2016, and it is projected to grow at the highest CAGR during the forecast period. The major driver for the growth of the infant formula ingredients market in the region is due to the high consumption of infant formulas from emerging economies such as India and China. Stringent regulations and increasing awareness for natural infant feeding are the major factors restraining the infant formula ingredients market. For instance, The China Food and Drug Administration (CFDA) issued one of its stringent regulations for infant formula. According to the regulations, import on infant formulations fall under the CFDA; this is expected to have a significant impact on international infant formula manufacturers. On the other hand, global health organizations such as the World Health Organization (WHO) and the United Nations Children’s Fund (UNICEF) recommend that young infants be exclusively breastfed from birth up to 6 months initially and partially up to two years. Educational campaigns promoting breastfeeding have been initiated in various countries such as South Korea. Promotions through the WHO have also been adopted by countries, such as China, the U.S., and the U.K. to increase breastfeeding practices. 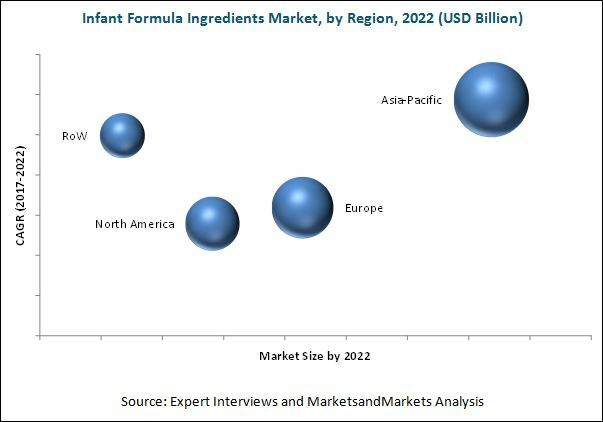 The infant formula ingredients market is characterized by medium to high competition due to the presence of a number of large- and small-scale firms with low product differentiation. New product launches, partnerships, and expansions are the key strategies adopted by these players to ensure their growth in the market. The market is dominated by players such as AAK AB (Sweden), Fonterra Co-operative Group Limited (New Zealand), Carbery Food Ingredients Limited (Ireland), Royal FrieslandCampina N.V. (Netherlands), Sachsenmilch Leppersdorf GmbH (Germany), BASF SE (Germany), Koninklijke DSM N.V. (Netherlands), Arla Foods amba (Denmark), Chr. Hansen Holdings A/S (Denmark), Kerry Group plc (Ireland), Lactalis Ingredients (France), Glanbia plc (Ireland), and Vitablend Nederland B.V. (Netherlands). *Details on Business Overview, Strength of Product Portfolio, Products Offered, Business Strategy Excellence & Recent Developments, Might Not Be Captured in Case of Unlisted Companies.